Nahan is a beautiful city located at an altitude of 3000 ft.
Did You Know of These Hill Stations Near Delhi? Delhi is home to some very diverse cultures and at the same time, it holds historical importance too. That leads to a number of tourists, local and foreign, visiting Delhi, in a bid to explore the forts and the markets of Delhi, apart from its rich and diverse culture. If you have been planning to visit Delhi on a vacation, you might be excited to know that you can also plan to visit a hill station around Delhi as well. While in Delhi, why would I want to explore a nearby hill station? The charm of the city of Delhi is sure to attract you and amaze you but the fact that Delhi is an urban metropolitan city that happens to be densely populated and full of traffic will, sooner or later, make you feel the dryness of the modern moribund city life. This will kindle within you the desire to get away from all the commotion and rest, relax and find peace and calm in the lap of Nature. It is, therefore, advisable that you plan your itinerary considering visiting at least one hill station around Delhi, they all are easily accessible by car, bus or train. 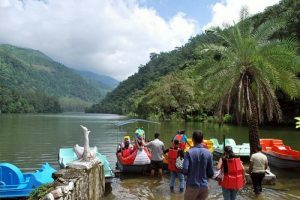 Within a radius of just 300 km from Delhi, there are a lot of beautiful hill stations, Dehradun, Nahan, Lansdowne, Parwanoo, Sattal and Nainital being a few of them. Within a range 300 to 5000 km from Delhi, hill stations such as Mussoorie, Shimla, Dharamshala and Manali can be found. Of all the aforementioned ones, whichever hill station around Delhi you choose to visit, it will offer an unparalleled experience. Moreover, in order to experience a luxurious stay, you must book your stay at Grand View Resort. Visit Himachal To Experience Nature At Its Best…!